I have a query regarding the hull to deck joining method of your 371's. Mine is No. 059 from 2001. The join is made by self tapping screws through the toe rail, deck and hull flange. See the picture. I would have expected this to be by bolt and nut. I am aware that Bavaria use this self tapping method but I though that Hanse were more traditional. Can you guys advise me how it is done on your models. I am worried that only the early boats used this method and I am not sure how good / strong it is. To be fair I do not have any issues, just concerned. All Hanse decks are joined like thar. don't think that the tapping screws are responsible for the integrity of the joint. 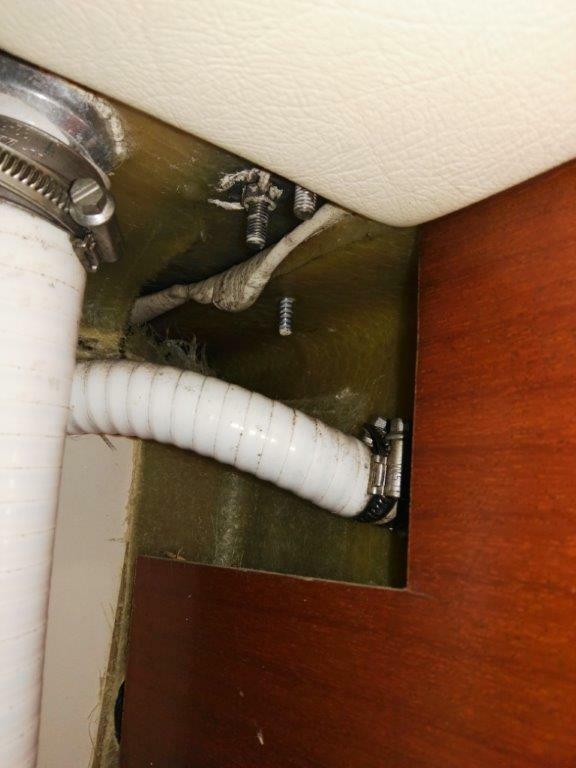 Afaik the hull/deck joint is a solid laminate which is covered with white Sika on the outside. There are numerous threads here in the forum about the 2013 build period where Hanse switched suppliers for the PU joint, which degraded. These threads confirm that it was a purely cosmetic issue, not a structural one. I dont think the hull and deck are laminated together. It is the screws and the Sika that holds them together. Only at the rear end the hull and deck is laminated together. There you don't want to use any screws. The yard told all customers with the dirty PUR seal, that the seal is purely cosmetic. I use to have a Hanse 371 from 2004. Not sure if that was built in the same way as the 2001 model. But on my boat the hull to deck joint was glassed and covered with gelcoat. I realized that when I replaced the crappy fender rail that was actually covering the jont. The self tapping screws on your picture is only securing the toerail. On later models (like my current boat, Hanse 400) deck and hull are glued. All, thanks for your replies, I feel a little better about it now. There isn't an issue just wasn't sure when I saw the self tapper. The 371 is stronger built than the newer models. The transom is also glassed into the hull. The only weaknes I had on mine was the rudder was leaking. I fixed that myself by drilling several big holes (d=100mm) from the starboard side and after it had dryed out (2 months indoors) I replaced some foam and put on new glass/epoxy. The leak (where the rudder stock enters) was sealed with sika after I had grinded a 3-4mm grove around in the GRP to get it to stick better.